Milk chocolate and orange in a scone form, yes please. Creaminess of the milk chocolate balances the citrus tartness. Growing up in the 90's, I remember these giant hunks of chocolate that were wrapped in foil and looked like an orange and was orange flavored was all the rage. Those who don't remember the advertising, you would whack the 'orange' to open up it slices. You don't see them that often now but during the holiday season. This is what inspired me to make Chocolate Orange Scones that and my mom suggested to make this type of scone. If you think this scone will be dry like you may have had in the past, you would be wrong. They are soft, buttery and moist. 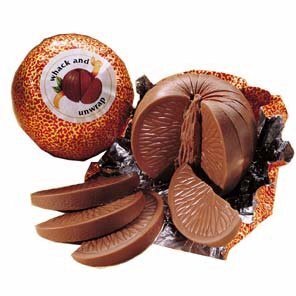 Do you remember the chocolate oranges? Let me know if the comments below. Prep: 45 minutes to 1 hour. 1.) Zest and juice oranges and set aside. In a large bowl, combine 2 1/2 cups flour, sugar, sea salt, and baking powder. 2.) Cut butter into flour mixture with pastry blend or two forks into small chucks. Add orange zest and vanilla extract to the flour mixture. 3.) At a tablespoon at a time and alternating, add buttermilk and orange juice until mixture holds together. Add room temperature egg. 4.) Fold in milk chocolate chips and the last 1/2 cup of flour. Place parchment paper onto cookie sheet. Gently press out scone dough into a large circle or rectangle on pan. Cut out into triangles. Place in refrigerator to chill for 30 minutes to 1 hour. 5.) Preheat oven to 350 degrees. Brush milk on top of scones and bake for 15 to 20 minutes or until lightly golden brown. Rotating halfway through. 6.) Let cool on pan for 5 minutes. Separate triangles so the edges with cool and transfer onto the wired rack to cool completely. Scones are always delicious and I love the combination of chocolate and orange. A wonderful afternoon treat. Chocolate and orange such a winning combination. This scone would be ideal for mid morning, ,when I need a chocolate hit. The phrase whack it unwrap it still makes me smile. I used to love those chocolate oranges! I love that these scones are chocolate and orange flavoured too as it's definitely a great combination. I remember those oranges. Though I think I only ever tried a taste of a friend's. I like your scone recipe, and the way you alternated the buttermilk and orange juice to moisten the flour mixture. That's a clever way to incorporate both without making the dough too wet! Yes, I do remember chocolate oranges. I loved them too. It's a great flavor combination. Your recipe sounds delicious! I'll pin it for later. these look so ridiculously tasty! I am going to make them tomorrow! Yummy! I love orange and chocolate together! I never tried that combo in a scone before. I may have to try it out! I put one of those in each of my kids' stockings for Christmas (the chocolate oranges). When they grew up and I stopped one year, everyone noticed and was not happy, lol, so now they're back in as their annual holiday stocking treat. The scones sound delish. Yummy!! I used way more orange juice (I didn't keep track of how much just kept adding until it seemed right). I also used chocolate chunks and it ended up tasting just the chocolate scones at Starbucks. Now I can save my $1.50 and just make them at home - thanks!!! I'm gonna have to replace the orange because I've never been a fan of the combination of chocolate and orange. So any suggestions of what I should use instead? I remember those things, those were awesome. If this scone tastes remotely like those, it's worth a try. Gonna have to replace the orange! Any suggestions? Love Terry's Chocolate Oranges (they're not Terry's, they're mine!) and love the inspiration of using those flavours in your scones! Well, I never had seen that chocolate orange before but now I have. Love it that you bring out the past and try to make something out of it. Childhood memories are the best. Would love to give your recipe a try at home!! Oh my gosh I can't get over how yum this sounds. Those pictures have my mouth watering like crazy. I really don't like orange with chocolate anything. Any suggestions on what to use instead? Maybe cinnamon or add vanilla beans to it. Wow! This looks so yummy. Now I want it in my tummy. Childhood memories! This milk and chocolate orange scone looks so delicious and tempting. I will definitely try to do this. I totally remember those chocolate oranges! Do they still make them? I haven't had one in ages. Sounds like if I have a craving I should try your yummy looking recipe. I think they only make them during the holiday time like Christmas. That is the only time that I have seen them. ooh theese look super yummy! I love the combination of chocolate and orange flavors- such a flashback to the oranges in my Christmas stocking. These scones sound incredible! I am obssessed with chocolate chip cookies. This Chocolate Orange Scones would be perfect for me for my birthday cake. So mouthwatering! Chocolates are my greatest weakness and you just made it all the more delectably enticing with this recipe! Everything you makes looks so good! I'll definitely have to try this one! Yum. Those look delicious. I don't think that I have had the chocolate oranges. I'll have to give them a try. I was skeptical about orange and chocolate until I tried to recreate Zoolander'Orange Mocha Frappuccino, it's an incredibly delicious combination! I can't wait to try this! I am obsessed with chocolate orange flavour things, so these look amazing! Such a simple recipe too! Orange and chocolate is one of my favorite flavor combos! These would be great for my next tea party! These scones look just perfect with the orange and all that chocolate. They would be awesome at tea time! Chocolate and Orange Scones sound just too delicious. I do love the combination of those two flavors and in a scone just makes my mouth water. I will have to try this out at some point. No, I've never heard of or seen the "whack and unwrap" orange and chocolate balls. Very different! However, the combination of orange and chocolate sounds interesting to try. I know chocolate is good with bananas, cherries, and strawberries - so why not orange? I'm a 90's kid and so remember the orange chocolates! These scones look delicious. I love hosting brunch, so I'm going to have to work these into the rotation! Oh my goodness this looks incredible. I love orange and chocolate together. I completely forgot about the chocolate oranges! And I would never have thought of the combination of orange and chocolate chips, but it's a delicious mixture! Can't wait to try these out! My family love scones. So i have to try these soon. Love all the yummy ingredients which goes into the making of these ! I love scones. I can't believe I haven't had even one this year. The chocolate orange is a wonderful flavor combo. I definitely remember those chocolate oranges! These scones sound amazing.... I'm gonna need to save the recipe to use later! This recipe looks absolutely amazing and totally fall. Love it so much!!! These looks so good! 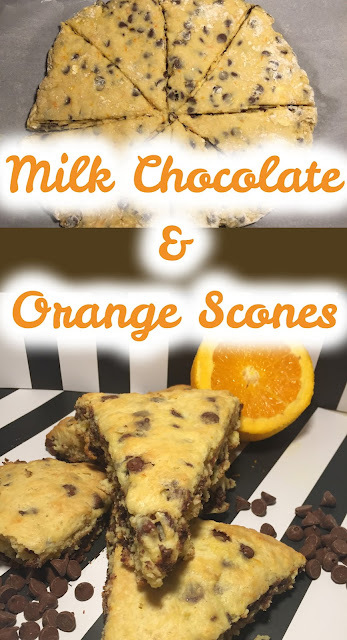 I like the combination of orange and chocolate for this recipe. I might try this. Thanks! I used to love those chocolate oranges! do they not make them anymore?! Uhmm looks yummy and interesting recipe. I love, oh we love chocolates but combining it with orange, I wonder how it taste. Thanks for sharing.